Click on the menu of Main Pages here, on a photograph to enlarge it, or on a blue hyperlink below. 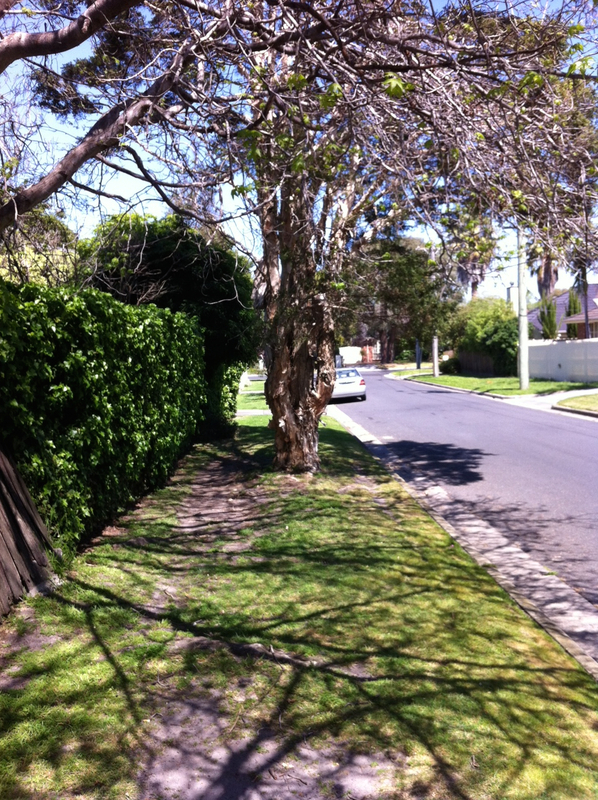 Limit paving: In a residential street with a low traffic volume, or with an adequate path on the other side of the street, or where a majority of abutting residents in the street express their preference for a green verge or verges, residents can enjoy a fully green road verge, without concrete, bitumen or other paving, and ask to have it deliberately kept green. The known tendency of some “consultants” and Council staff to push new works is gradually extending a creeping hardening and heating of our unpaved areas, but you can oppose it. BCS Inc’s response to Council’s Walking Strategy definitely opposes this ingrained tendency. See BCS Inc’s 2016 letter and comments on Report on Council’s recent consultation on its footpath policy. See hyperlinks below to photos of 31 Beaumaris streets where all or part has one or more verges without a paved footpath. Five of those streets are the internal streets of the entire Deauville Estate. The Deauville Estate Residents’ Group works to keep it enjoying those green verges without paved footpaths, as it has since it was subdivided in the 1920s. The Special Landscape Overlays at Point Avenue and Coral Avenue now protect the green ambience of those two avenues. See a legal opinion about councils’ limited liability for pedestrians’ risks. The residents of Te Hongi Court, listed below, unanimously requested, with the help of their then Ward councillor, Cr Derek Wilson, that the concrete footpath around the court be removed, to leave the present natural surface. Bayside City Council agreed to the removal, at the residents’ expense. Shared driveways: Bayside City Council should require that, wherever possible, new multiple occupancies on a standard-size lot should share a single common driveway and a single vehicle crossing over the nature strip, to maximize the retention of the nature strip area and associated street parking. A defined maximum width should apply to all vehicle crossings, and they should be at right angles to the kerb to avoid the extra area consumed by a slanted crossing. Remove redundant crossings: Bayside City Council should remove paved vehicle crossings on nature strips that do not connect to a driveway, and replace them with the same vegetation as on the rest of the nature strip. 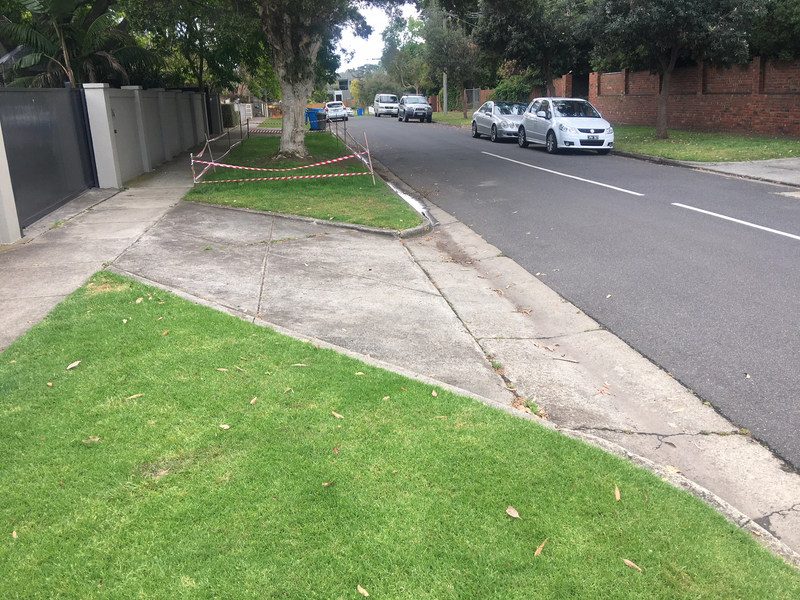 Bayside City Council should make it a condition of its approval for future vehicle crossings that the landowner must pay to remove a crossing as soon as it no longer connects to a driveway. Indigenous plantings possible: BCS Inc. commends Bayside City Council’s intention to establish rules that would enable occupiers of land to undertake planting of indigenous vegetation on their nature strips. Return to the CAMPAIGNS page.